Ostinato has produced recordings of Guastavino's complete piano solo works in 3 CDs, and a CD of songs and works for piano duos and duets. 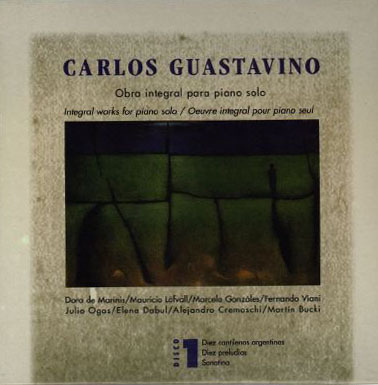 These 3-CD set contains the world-premiere recording of Guastavino's entire output for piano. His attractive piano works are all based on Argentina's folk music, and combine lyricism, a luscious harmonic palette and a masterly command of the piano. The sincerity and beauty of these work immediately touch the heart of audiences worldwide. Pianists: Dora De Marinis, Alejandro Cremaschi, Fernando Viani, Elena Dabul, Julio Ogas, Marcela Gonzalez. Songs from "Edad del Asombro"
This new release contains works for tenor and piano, mezzo-soprano and piano, and works for piano four hands and piano duos. It features an attractive sampling of Guastavino's songs that put in evidence his love and mastery of this medium. Also included are the exciting "Romances para dos pianos" and his late "Romance del Plata", which was described by the composer himself as "the triumph of melody." Recorded in Germany in 1999 and 2000, this release is the first one on Ostinato's own label. Songs for solo voice and piano: Sonetos de Quevedo, Flores Argentinas, La Edad del Asombro, etc. Guillermo Anzorena and Alicia Borges, voice. Fernando Viani and Dora De Marinis, piano. Master ready for release. Works for two pianos and piano four hands: Tres Romances, Llanura, Se equivocó la paloma, Gato, etc. Piano: Alejandro Cremaschi, Elena Dabul, Dora De Marinis, Pervez Modi. Master ready for release. Songs for choir and piano: Indianas No. 1 and No. 2, Romance de Ausencias, etc. Ostinato Ensemble. Master ready for release. Selected piano works. Master ready for release. Various artists. Romance de Santa Fe for piano and orchestra. Piano: Alejandro Cremaschi. Master not recorded.